Author G.L. Gonzalez’s Newly Released “Essence Of My Heart” is an Autobiographical Collection of Poetry that Inspires Hope. 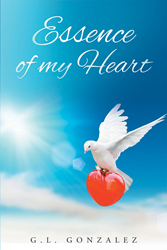 “Essence Of My Heart” from Christian Faith Publishing author G.L. Gonzalez is a collection of poetry that shares the author’s story and the lessons she has learned from numerous hardships. It reveals the importance of one’s relationships with friends, family, and God. “Essence Of My Heart”: an optimistic collection of poetry that seeks to inspire hope and faith. “Essence Of My Heart” is the creation of published author, G.L. Gonzalez. Published by Christian Faith Publishing, G.L. Gonzalez’s new book presents a collection of poems that inspires hope. “Essence Of My Heart” is about faith and love. Featuring poems of optimism and the struggles of hard times, it reveals the importance of having strong relationships with friends, family, and God. Through depression and a search for the meaning of life, this collection of poems offers readers hope. “Essence Of My Heart” is author G.L. Gonzalez’s journey through life and the spiritual growth she has earned through countless hardships. She hopes to pass along the lessons she has learned through her poetry. This collection of poetry is about having hope and putting one’s faith in God. View a synopsis of “Essence Of My Heart” on YouTube. Consumers can purchase“Essence Of My Heart” at traditional brick & mortar bookstores, or online at Amazon.com, Apple iTunes store, Kobo or Barnes and Noble. For additional information or inquiries about “Essence Of My Heart”, contact the Christian Faith Publishing media department at 866-554-0919.